Batman going home from a chemo treatment. We always stop and get a cheeseburger on our way home, so Batman looks forward to this part of his treatment. Even under the best of circumstances, going to the veterinarian can be stressful for both the owner and the animal. If you have to go repeatedly due to a serious illness, especially if the visits include invasive procedures, then going to the vet can quickly become a nightmare for all involved. My dog, Batman, has cancer. We go for chemo treatments every other week. As I sit in the waiting room of the clinic I can’t help but notice the behaviors of both the humans and the animals. It turns out that nervous owners and owners who just don’t understand their pet often make an already stressful situation worse for their pets. So, this is my guide to making the best out of a bad situation. Batman hates the cold floor of the waiting room, so he likes it if I bring his matt. It gives him someplace to park himself as well. Do bring your dog’s favorite blanket or rug if he has one. Waiting room floors are often cold and uninviting and they smell like all the other scared animals that have been there. Bringing a familiar sleeping matt can help the dog settle down into a comfortable spot while you wait for your appointment. If your dog is allowed food, do bring a long lasting chew for him to provide something to do while you wait. You could fill a Kong with his favorite food and some high value treat like peanut butter and then freeze it and pull it out for the wait. Or bring along a bully stick. There are some caveats here: Do not give your dog a high value chew if other dogs are seated nearby and can get to your dog. This is also not a recommended option if your dog guards resources from people or other dogs. But, if your dog is laid back, having a chew item will help keep him stress free. Do give your dog lots of love. Your dog is stressed, you are stressed. Rubbing your dog’s chin or behind his ears can be a great way to relieve the stress on both ends of the leash. You may find your dog appears more needy than normal. He may paw at you or try and insert his head under your hand. Now is not the time to swat at him and tell him to leave you alone. He may want reassurance that all is well. Do remember your dog has a highly developed sense of smell. You might not smell anything as you walk into a clinic, but rest assured your dog smells everything including the fear scent of other terrified animals, strange chemicals, perhaps even death and he smells the increased perspiration of nervous owners. If your dog needs a few minutes to decide to walk through the clinic door, respect that wish and help him out by giving him some slack on the leash, enticing him with high value treats or just get down on the floor and ask him to come with him. Ask the staff if there is a different entrance. Sometimes just switching doors can help a dog overcome the fear of walking into a clinic, especially if the clinic you are walking into forces the dog to instantly confront lots of other dogs. Imagine how you would feel suddenly walking into a room and being stared at by lots of strangers who could pose a threat to you. That’s how your dog might feel going into a clinic. Do consider using calming products such as ADAPTIL or a Thundershirt prior to going into the clinic. You can spray ADAPTIL on a bandanna or on the dog’s leash or blanket. If your dog responds well to wearing a Thundershirt, put that on him before you enter the clinic. Do be an advocate for your dog. If you know your dog does not like slip leads, then insist that he be walked on his regular leash and collar or harness. If your dog is afraid of tight hugs, ask the staff to practice low stress handling techniques. For example, Batman does not like to be safe hugged, but if you stand in front of him and gently massage his ears while holding his head he will stand still for most procedures without issue. He also is highly food motivated so a hot dog in front of his nose will also get him to work well with staff for procedures. Do not assume the clinic staff understands low stress handling. Ask how your dog will be restrained, what the procedure will look like and offer suggestions on how to make your dog’s experience the best it can be. If your dog is better with you by his side ask if it is possible for you to handle your dog during his procedure (I have not had much luck getting anyone to let me handle Batman, but other people I’ve spoken with have been allowed to handle their dogs). Do consider training specific behaviors if your dog has to go to the vet long term. You could teach your dog to raise his leg and allow someone to hold it, thus making blood draws easier. You could train your dog a chin rest, so he rests his chin on someone’s hand while other people handle him. Do remember that stress causes dogs to do things they would not normally do such as growl, bite, snap or have potty accidents. If your dog pees or poops in the waiting room it is OK and won’t be the first time that happened. Just remain calm, assure your dog it is ok and ask for help with clean up. Allow at least 10 minutes prior to your appointment to give your dog plenty of potty time outside before you have to go in. Do leave the waiting room first once it is time for your dog to go back with the vet tech. This is especially important if the vet tech has a hard time leading your dog away from you. If you walk away first, chances are much greater that your dog will willingly go along with the vet or vet tech once he can no longer see you. It is stressful for everyone if someone has to pull your dog away from you. Do consult with a trainer or behavioral veterinarian if you want to learn more about ways to help your dog feel more relaxed during repeated vet visits. Do visit the waiting room on days when you aren’t there for a real visit, walk in, give your dog a treat and walk out again. That way he won’t be so stressed every time you come in. This is not puppy play time, social hour at the dog park or the canine training school. Don’t assume your dog wants to meet all the other dogs in the waiting room (even if he is normally a social butterfly). Don’t force your dog to do behaviors if he isn’t up to the task. Below are all examples of things I’ve seen while waiting for Batman’s appointments. If your dog is coming out of a procedure, it won’t be feeling its best. How is not the time to allow other animals to come up and sniff your dog. A woman with a yorkie in her arms walked up to a woman with a dachshund in her lap. The woman with the yorkie shoved it into the face of the dachshund saying “oh, my little girl just loves to meet friends.” Then both women squealed with delight and said “look they are kissing.” In reality, the dogs were licking each other’s chins. It was an appeasement gesture. Then both dogs turned their heads as far away from each other as possible. The dogs were really saying “our owners are clueless, I am really sorry I am rudely invading your personal space. I mean you no harm. Sorry.” If you were in the hospital awaiting a procedure, would you want a complete stranger to come up to you and hug you or invade your personal space? Probably not. Even dogs that love meeting other dogs probably do not want to meet them in a stressful waiting room. And the dog your dog may be meeting could be super stressed and not in the mood. I saw a dog bitten in the face by another dog in the waiting room. I felt bad for the dog that bit because everyone looked at it as if it was a bad dog and the owner screamed at it. The dog was sitting in a corner, trapped when another dog was allowed to come up and greet it. The dog tried everything it could to move farther away but there was nowhere to go so he bit. Dogs are all about social distancing. They want to be able to increase the distance between themselves if at all possible to avoid stressful encounters. A man with a corgi had the corgi on a retractable leash. The lock was not set on the leash, so the corgi had about 20 feet of leash to play with. The man was engrossed in his cell phone for 10 minutes while the corgi explored and got tangled around chair legs. When I body blocked the corgi from approaching Batman, the owner said “he’s friendly.” Awesome, so is my dog, but he doesn’t want to meet your dog right now. The owner became argumentative about the benefits of dogs having friends. I chose a new place to sit in the waiting room. It is totally awesome if you have taught your dog behaviors such as sit and down, but don’t be surprised if your dog doesn’t immediately comply in the waiting room at the vet’s office. I watched a man force his trembling dog into a sit after the man had been repeatedly telling the dog to sit for more than 5 minutes. The dog was terrified of the waiting room. He was lip licking, trembling and had ropes of saliva dangling from his mouth. He didn’t want to sit. He probably didn’t even know his owner was talking to him and he certainly had not been taught to sit when lots of distractions were happening. If your dog knows lots of behaviors and you’ve taught him to do those behaviors in lots of different situations, then asking him to work for you can be a fun way to keep him occupied. Batman and I play hand targeting and foot targeting games while we wait. But, only if Batman wants to. If I ask him to target and he doesn’t, I don’t ask again. Targeting is his favorite game and if he won’t do it, I know he is stressed. Yelling at him or forcing him won’t help either one of us. And shouting at your dog to stop barking or whining isn’t working is it? Now all the dogs are barking and all the owners are on edge because they have just listened to you for 10 minutes shout at your dog about his barking. He is barking because he is stressed out and he is getting you to interact with him. Ask the vet staff to call you when it is your turn and take your dog outside where he has more space or wait in your vehicle (weather permitting). I saw a woman grab the snout of her barking dog and give it a firm shake and the dog wilted under a chair where it remained trembling. And if you are bringing your pet rabbit or bird into a clinic full of dogs on leash, consider putting your small pet into a protective carrier. I watched a man bring his rabbit in wrapped in a towel. I had to move Batman clear across the room after the rabbit started twitching its ears. Batman was way too focused on that bunny. So, relax, take a deep breath and do all you can to ensure you and your dog have the best experience possible. 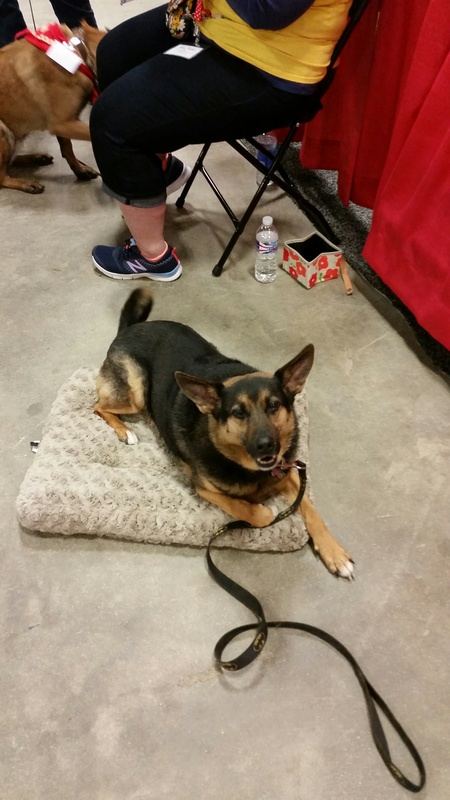 This entry was posted in Dog Training on October 9, 2015 by connieswaim.